The fact that Annette Benning doesn’t have an Oscar is evidence that the whole Oscar thing is a sham. 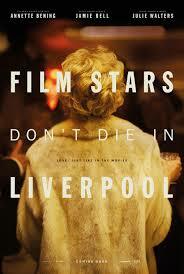 Film Stars Don’t Die in Liverpool is another example of one of the best actors in film displaying her talent. Her turn as an agin Gloria Graham is just a delight to watch. It is layered and complicated and empathetic. This is the story based on a memoir of one of her last lovers, a much younger British actor whose family took her in during her last days. The film is a bit rose coloured in its portrayal of Graham. Peter Turner’s rememberance of her is one of a doting crush. He owes see her flaws and shows us some, but he couches those flaws in a passionate love of her so we feel it too. Liverpool is set up as lovely tragedy. A star too bright to shine on forever and gone too soon. But the power of the film rests mainly in Benning giving such a tour de force performance. She enriches the part and makes us love her. Without her I’m not sure Turner’s tribute would have worked so well. The rest of the cast is great too and director McGuigan who has shown some audacious strength in his past films does a great job of finding a way to tell this story’s tale so it doesn’t feel too cliched. But it all comes together around a performance which should have won its star an award, despite not getting nominated at all.